Early this week, a photo popped up on our Instagram feed showing an impressive cathedral on the town square of Concordia in northwest Colombia. It was a hint to the whereabouts of Brian, our roastmaster, who left last week on a solo trip to visit coffee contacts deep in the Colombian mountains. The cathedral bells begin ringing "early in the morning for all to hear,” the post noted, with the hashtag #wakeupcall. 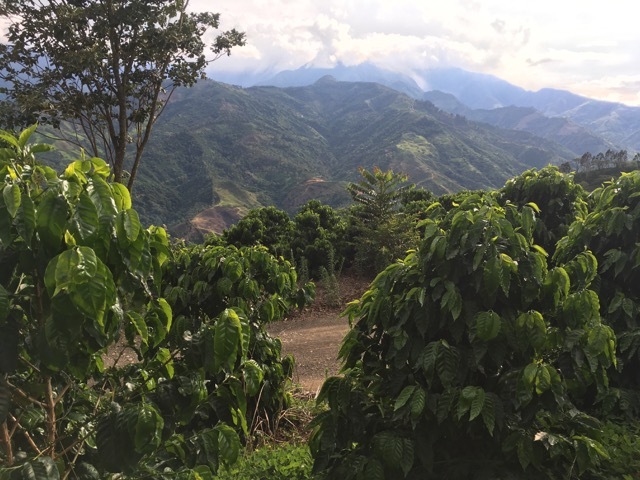 This week, as Brian has been roaming Colombia, we have been roasting and serving on pourover the Colombian coffee that helped set the DoubleShot apart as an innovator, our Maduro. “I have been drinking knock-your-socks-off coffee that few have yet had a chance to sample. Rich, balanced, chocolaty, fruity, yummy,” his article began. Pendergrast went on to describe how Brian partnered with Hacienda El Botón, the farm of Ariel Montoya, to bring the first natural coffee from Colombia to the United States. Hacienda El Botón has been growing coffee trees of the Maragogipe variety nearly 4,500 feet above sea level since 1931. Maragogipe coffee trees are larger than other coffee trees and produce big beans, which are sometimes called elephant beans. Coffee in Colombia is typically processed using a “wet” method, in which the skin is removed from the coffee cherry and the pulp allowed to ferment in vats of water before it is washed off and the coffee dried. But on a visit to El Botón in 2009, Brian spoke with Montoya about experimenting with the dry method on his Maragogipe beans. In this method, coffee cherries are dried naturally in their skins on raised screened beds, allowing complex flavors to develop in the beans. Last spring, Andrew Jolly, otherwise known as the DoubleShot’s governor, accompanied Brian on a trip to Hacienda El Botón and saw the dense walls of Maragogipe trees with their broad, green leaves for himself. Andrew says his travels to El Botón and other coffee-producing regions of the world have given his work serving those coffees to DoubleShot customers an added level of conviction. We’ll have fresh-roasted Maduro on pourover through Monday. You can also get it by the pound. Our bakery has come up with cherry almond granola bar that’s drizzled in chocolate and designed to bring out the Maduro’s delicious fruitiness. Try them together. And if you’re really feeling adventurous, close your eyes as you sip and imagine the bells of Concordia calling you awake.